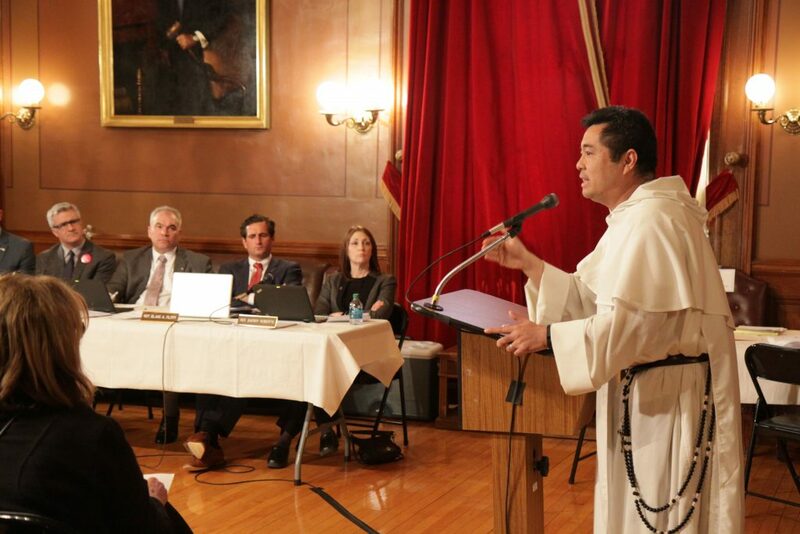 The Dominican Friars are no stranger to public debate of contested ideas. Among medieval scholastics, disputations on contentious questions often took place before large crowds and according to highly formalized rules of debate. Today, in a society wracked by fundamental divisions, the friars seek to elevate the discourse and find common ground while upholding the truths of the faith and natural reason. Fr. Boniface Endorf, O.P., recently addressed Ohio lawmakers in support of a proposed bill protecting pastors from officiating at civil unions in violation of their religious convictions. “The issue here is whether an American has the right to believe what all the Founders of this nation believed about marriage and the human condition, or not,” Fr. Endorf stated. Fr. Nicanor Austriaco, O.P. professor of biology and bioethics at Providence College, was called before the Rhode Island House Judiciary Committee to testify against a bill that could roll back regulation of the abortion industry. “You end up having this situation where a woman struggles with the incoherence of what she has done. This bill does not acknowledge that,” said Fr. Austriaco, speaking of his experience at Project Rachel counseling women who regretted having abortions. Fr. Pius Pietrzyk, O.P. is one of the Republican members of the bipartisan board of the Legal Service Corporation (LSC), which provides civil legal aid to low-income Americans. “In my tenure on the LSC Board, I have tried always to emphasize that the primary goal of LSC is to help the poor—not federal bureaucrats and not ideologues,” writes Fr. Pietrzyk in an article calling for continued funding of a successfully restructured LSC. By supporting the formation of Dominican Friars, you ensure that the charism of St. Dominic and the wisdom of St. Thomas continue to serve as leaven in our society during these difficult times!